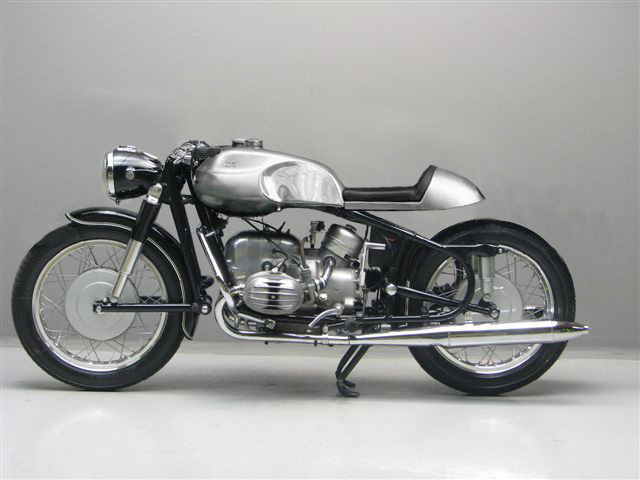 Not sure if it is a cafe, or a bobber… but looks fun! This was back on October 29th, 2011. Wow. What can i say. LOTS of cars. Lots of NICE cars. It was great seeing all the 2002s and 1600s there. Here is a flicker gallery of some of the ones that caught my eye. Of course i shot way more photos… but i had to edit. Prior to the event, i talked to the coordinators about adding motorcycles next year. They really want to do it… so stay tuned. Hopefully Vintage BMW bikes will be there in 2012. 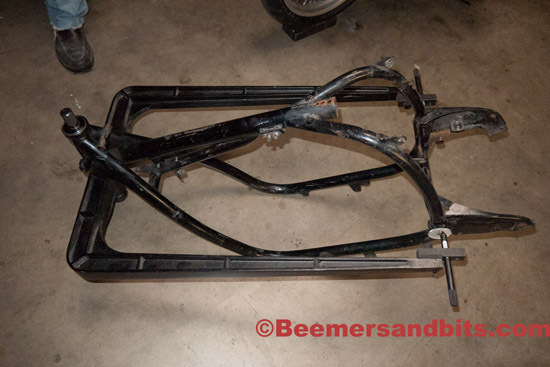 Upon the typical visual inspection, the frames appeared to be straight. 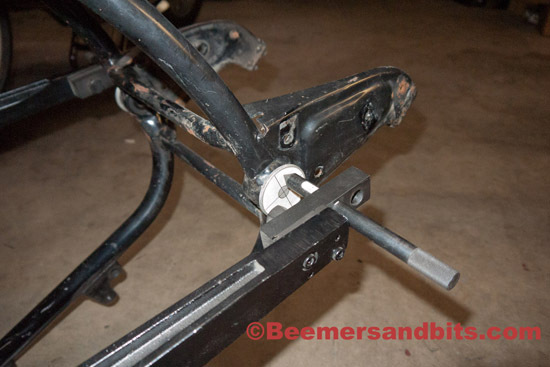 The plates or gussets near the neck are not bent and there is no major damage near the swingarm mounts. But i want to be 100% sure. 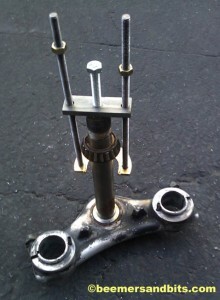 I took my /5 frames to a semi-local BMW mechanic who has one of the old ‘BMW shop only’ frame alignment jig. These tools are hard to come by and I’m glad I met somebody within 30 minutes that has one. 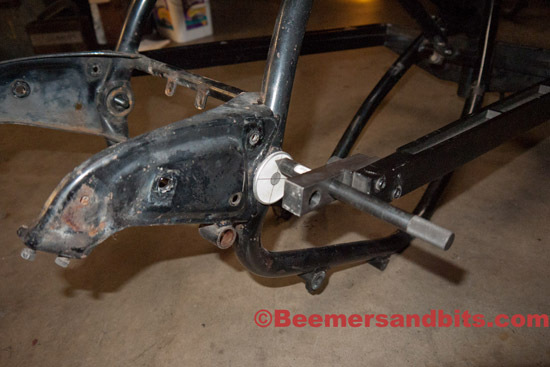 It attaches to the frame through the steering neck with the races left in the frame. Two small targets are inserted into the swingarm bearing area. The jig didn’t line up in the center of the target but we were able to confirm that everything lines up identically on both sides. One frame lined up in a different spot on the target vs the other, but both had matching sides. Maybe there was some variation in these /5 frames over the 3 years they were made? It might explain why some people have had terrible times with SWB handling and others had zero problems. It is hard to tell in the photos, but the jig matches the same area identically on the target on each side. 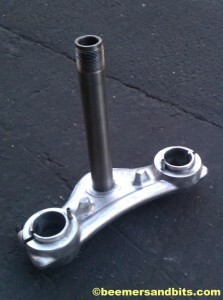 Alignment marker in the swingarm bearing area. Right side matches the left side identically. Frame is straight. After this, i am going to do some reinforcement of the exhaust hangers since the rear sets will be attached to that area as well. Stay tuned for an update and those photos.. I love this shot. Looks like fun… however, if i was the passenger, i’d probably need a fresh change of underwear. 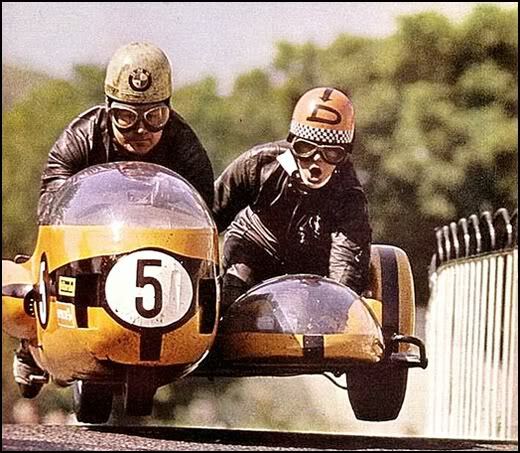 So as it turns out, the passenger in the sidecar is actually a woman… and her name is Dane Rowe. She is quite the vintage moto babe. Thanks to Shane for doing some digging about her and sharing the information with me. Look for an article on her someday on the Vintagent blog. She is still alive and well and has become a coin collector of all things… Cheers to Dane! It’s Better In The Wind – Short Film from Scott Toepfer on Vimeo. A while back I finally broke down and purchased some much needed BMW ‘only’ tools from Cycle Works. 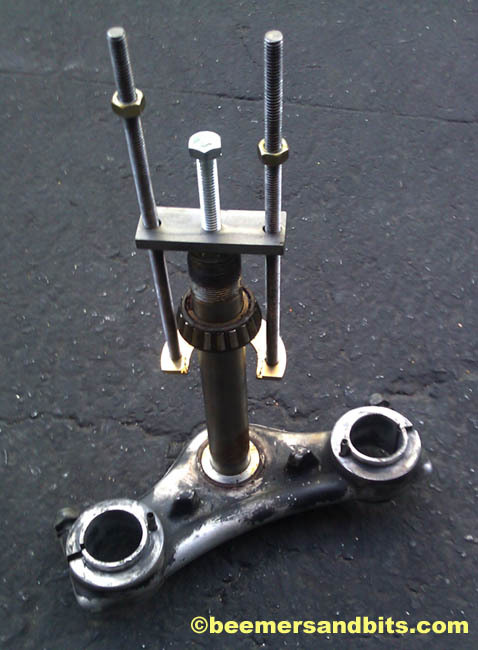 I’ve made my own tools in certain instances but i had no means of pulling the bearings from the steering column or triple tree neck. I wish i did this on my own cafe build. I was able to clean the lower triple tree better then ever. Cycle Works steering stem bearing puller.